The U.S. rig count increased by 15 to 1,683, while the quantity of offshore rigs fell by 1 to 93. The weekly Canadian rig count fell by 38 to 533. The overall North American rig count increased 285 from a year ago, while the U.S. tally rose 273. The Canadian rig increased by 12 from last year. Houston-based Baker Hughes , a provider of oil-field products and services, said the number of oil rigs rose by three to 299 from last week. A year ago, there were 181 such units. The company also reported that the amount of gas rigs increased by 13 to 1,381. A year ago, gas rigs totaled 1,228. You will have to be a Flickr member (free registration) in order to see or post pictures. 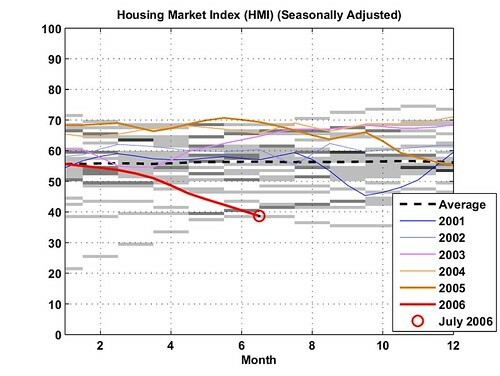 The Housing Market Losing Steam! 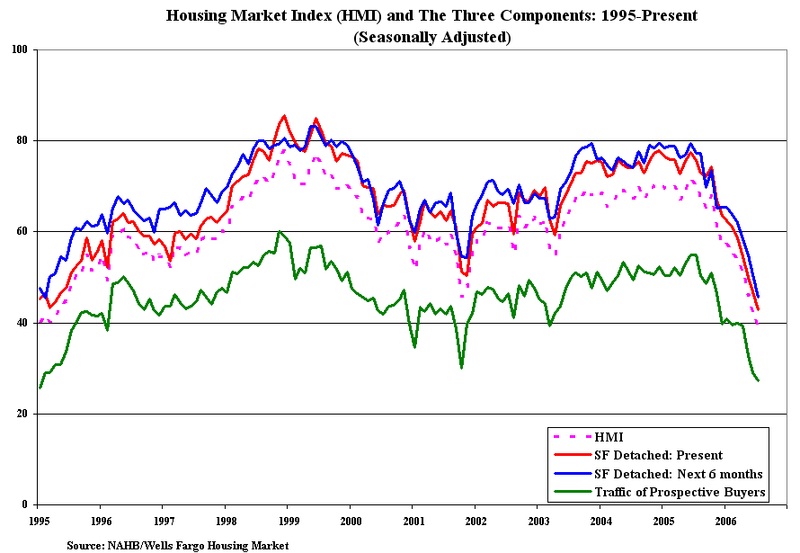 July 18, 2006 - Increased concerns about interest rates and housing affordability caused builder confidence in the market for new single-family homes to slip three more notches to 39, according to the National Association of Home Builders/Wells Fargo Housing Market Index (HMI) for July, reported today. In May, the producer price index -- the selling price received by domestic producers of goods -- of gypsum, a component of wallboard, rose 26.4 percent compared to the same month in 2005. Plastic construction materials jumped 18 percent, cement rose nearly 15 percent, and copper and brass products increased 86.9 percent from the same period a year ago. Fig. 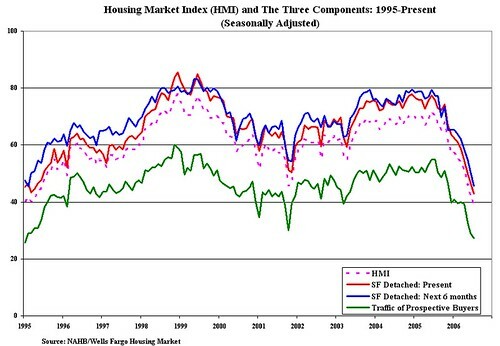 1 Housing Market Index (HMI) from 1995 to now (src: NAHB). The HMI is the average of three components as shown on Fig .1. The historical data for the HMI and its components can be found here and we can see that the current HMI value is near an all-time low for this time of the year and was almost twice as large one year ago. Fig. 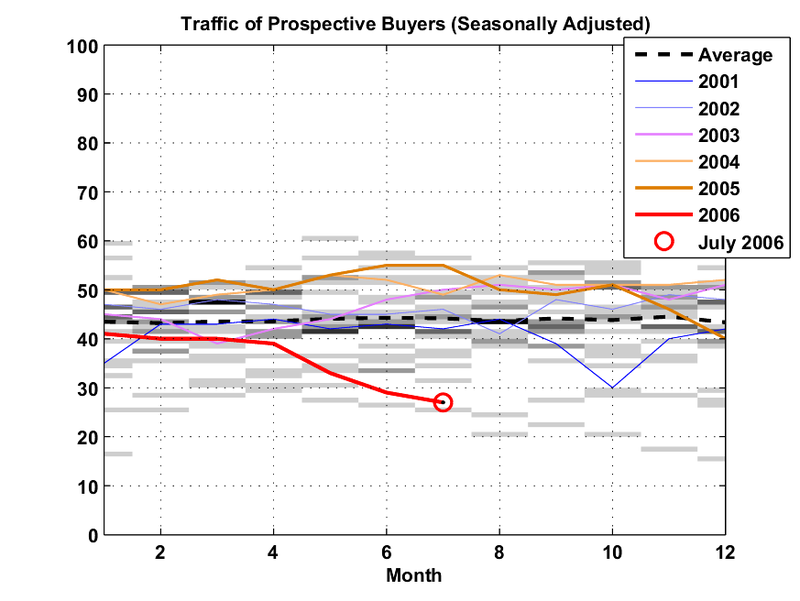 2 Traffic of Prospective Buyers index. The gray background gives the observed values between 1985 and 2005, the darker the shade the more frequent the corresponding value. Fig. 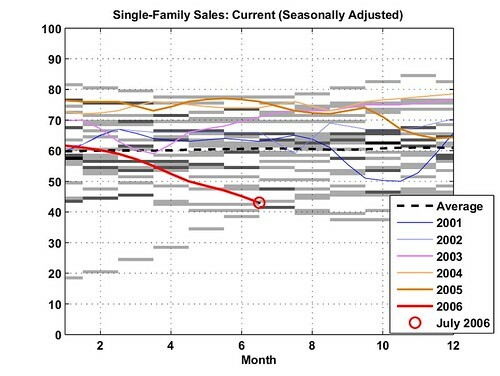 3 Single Family Sales: Next 6 Months. The gray background gives the observed values between 1985 and 2005, the darker the shade the more frequent the corresponding value. Fig. 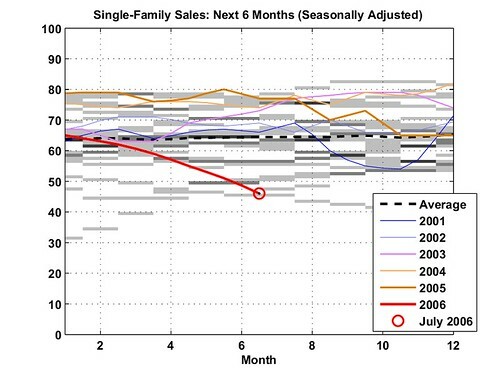 4 Current Single Family Sales. The gray background gives the observed values between 1985 and 2005, the darker the shade the more frequent the corresponding value. Fig. 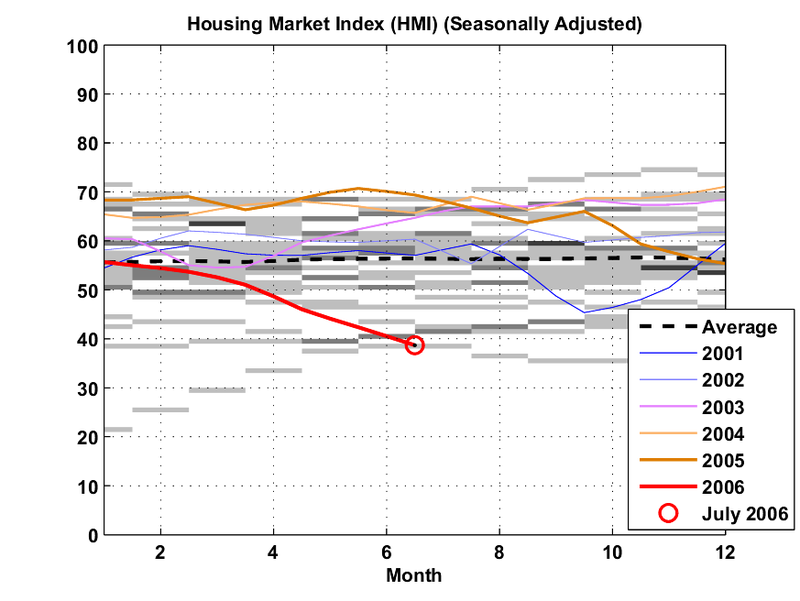 5 Housing Market Index. The gray background gives the observed values between 1985 and 2005, the darker the shade the more frequent the corresponding value. SAN FRANCISCO (MarketWatch) -- The front-month futures contract climbed past $76 a barrel Thursday for the first time ever on the New York Mercantile Exchange, with August crude touching $76.30 and last trading at $76.21, up $1.26. In regard to efforts to deny the reality of Peak Oil, I have previously described what I call the "Iron Triangle," which I define as: (1) most auto, housing and finance companies; (2) most of the mainstream media and (3) most major oil companies, major oil exporters and the energy analysts that work for the major oil companies and major oil exporters. 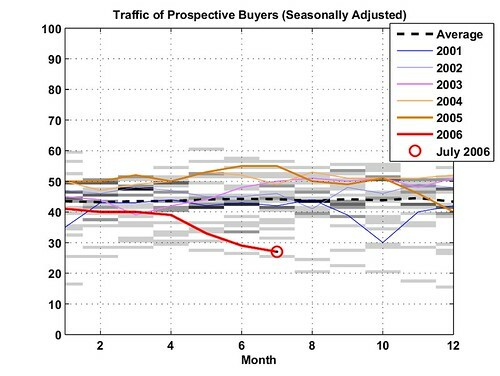 The auto/housing/finance group wants to continue selling and financing large autos and houses. The media group wants to continue selling advertising for large autos, houses and loans. The major oil companies are concerned that if they admit to the reality of Peak Oil, they may face punitive taxation. The major oil exporters are afraid of military takeovers, if they admit to the reality of Peak Oil. The energy analysts are hired guns. This group provides the intellectual ammunition for the other two groups. In all fairness, there are some notable exceptions. Mike Jackson, CEO of the AutoNation group, has called for a much higher gasoline tax, in order to reduce oil consumption. The Dallas Morning News, and some other papers, have run pro and con pieces on Peak Oil. ChevronTexaco, while not quite admitting the reality of Peak Oil, has come close. 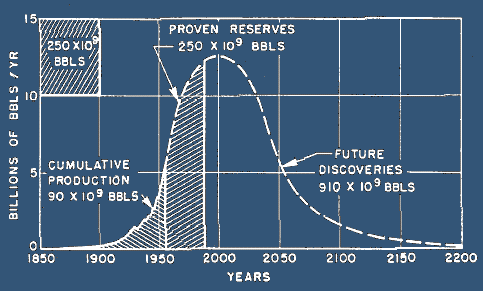 However, these are isolated exceptions in an ocean of Peak Oil denial. ExxonMobil is a good example of the major oil company faction. Opec of course is the Organization Of Petroleum Exporting Countries. 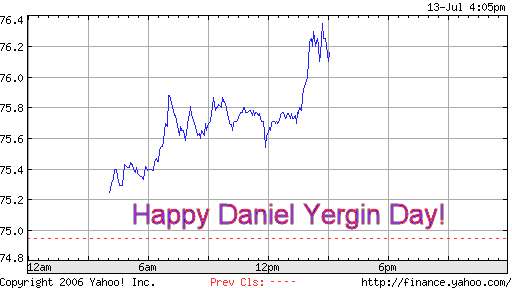 Cambridge Energy Research Associates (CERA), founded by Daniel Yergin, is a good example of the energy analyst faction. Following are recent direct quotes, in chronological order, regarding Peak Oil, by these three factions. "Rather than a 'peak,' we should expect an 'undulating plateau' perhaps three or four decades from now." We in Opec do not subscribe to the peak-oil theory. This post was originally published in TheOilDrum.com. Many natural object geometry are well described by a fractal (e.g. a coastline). In particular, fractal self-similarity is a powerful concept that has been investigated by Benoît Mandelbrot. However, in practice the self similarity law is not always perfectly respected. To remedy to this, Jean Laherrère has proposed the Parabolic Fractal Law (PFL) which adds a parabolic deviation to the pure self-similar law, I quote: A complete or near complete distribution of the larger objects, which in practice are usually readily identified and quantified, can be used to define the parabola following a rule of self-similarity, and hence describe the full distribution down to the smallest object. The distribution can in turn be used to determine the total population of the objects. I believe that the PFL could be a complementary tool to analyze production data under a different angle especially when the Hubbert Linearization technique does not produce a clear result. For instance, when applied to the United Kingdom production data, the resulting Ultimate Recoverable Ressource (URR) is very close to the value estimated by the Hubbert Linearization technique. I intend here to apply this technique to Saudi Arabia oil fields. Despite using coarse oilfield size estimates, the PFL seems to point toward an URR close to the ASPO estimate at 270 Gb. The distribution of oil field sizes is characterized by a few large fields (the king, the queens, etc.) at one end and a large pool of small fields at the other end. This pattern can be closely represented by a self-similar process. To understand this, let's imagine that the biggest field has a size of 2,024 Mb. The next fields in size will be 2 fields of size 1,024 Mb. Consequently, the self-similarity rule is to multiply by two the number of fields at each stage and divide by two their sizes. 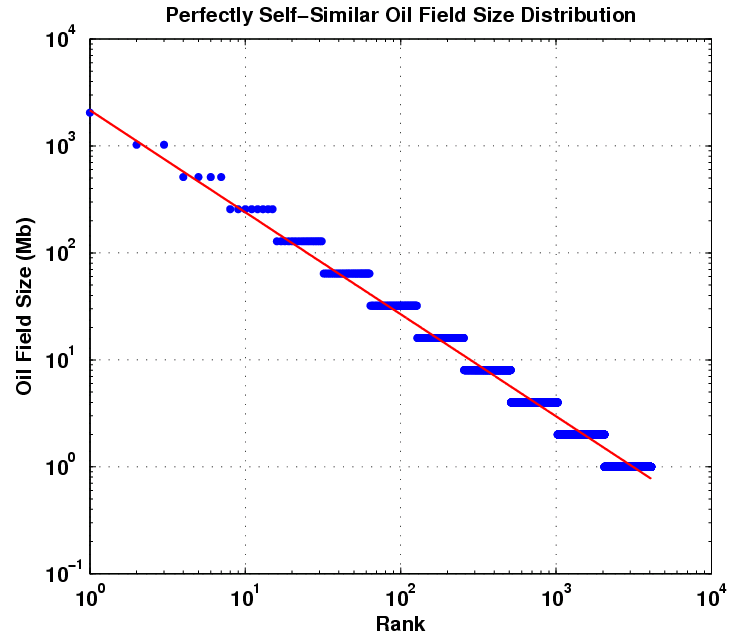 A convenient way to reveal the self-similarity law is to display the log of the ranked field sizes versus the log-rank as shown on Fig. 1. If the process is perfectly self-similar the points are distributed along a straight line with -1 slope value. Fig. 1 Example of a simple self-similar object size distribution represented in a log(rank)-log(size) plane. The red line has a slope equals to -1. Unfortunately, there is no public database on Saudi Arabia oilfields. We don't need to get an exhaustive dataset but only a few estimates about the size of the largest fields. I found some data about the top 9 fields from various sources on the web and from Simmons's book (Twilight in the Desert). The Field URR are ranked according to their size and represented in a log(rank)-log(URR) plane as shown on Fig. 2. When only an interval is available, we take the center value. 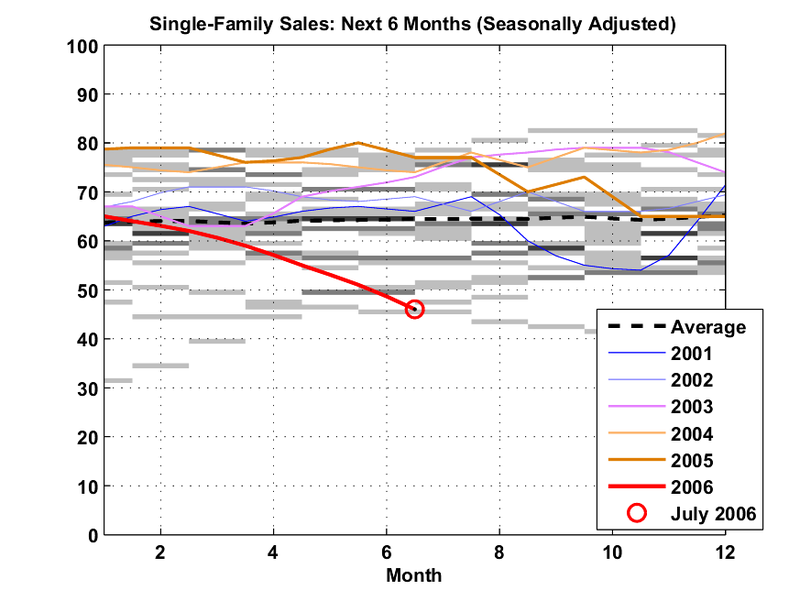 a robust linear fit (no curvature) is applied on the data points (red line on Fig. 2). A parabolic model is then fitted using the slope established in 2) as first guess for the linear term b and a fixed curvature value c (blue lines on Fig. 2). The algorithm used for this step is the Levenberg-Marquardt algorithm. 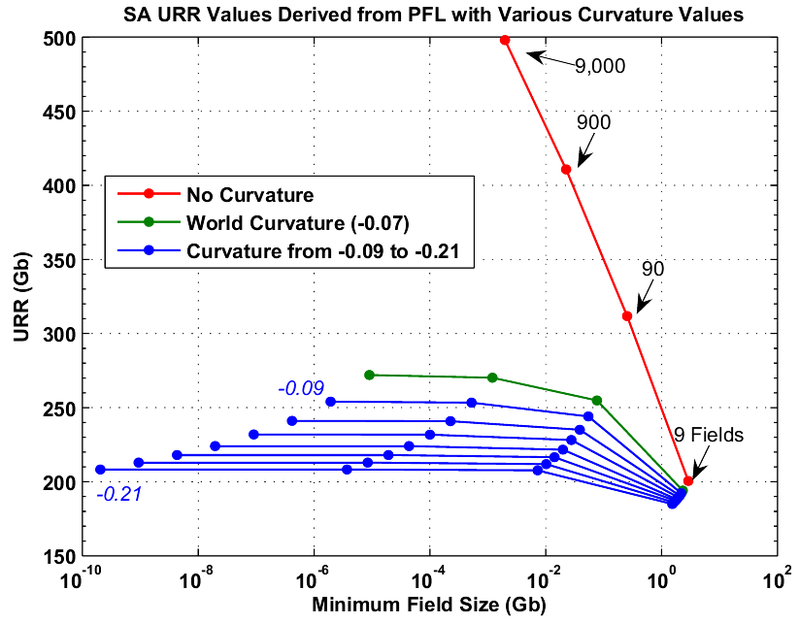 The URR values are estimated from the areas under the PFL curves conditionally to a particular minimum oil field size as shown on Fig. 3. Fig. 2. 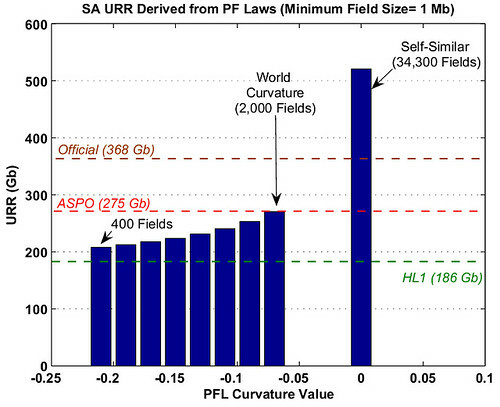 Estimation of various PF Laws with different fixed curvature values. Each data point is color coded according to the oil field age. Fig. 3. Derived URR from the PFL shown on Fig 2. 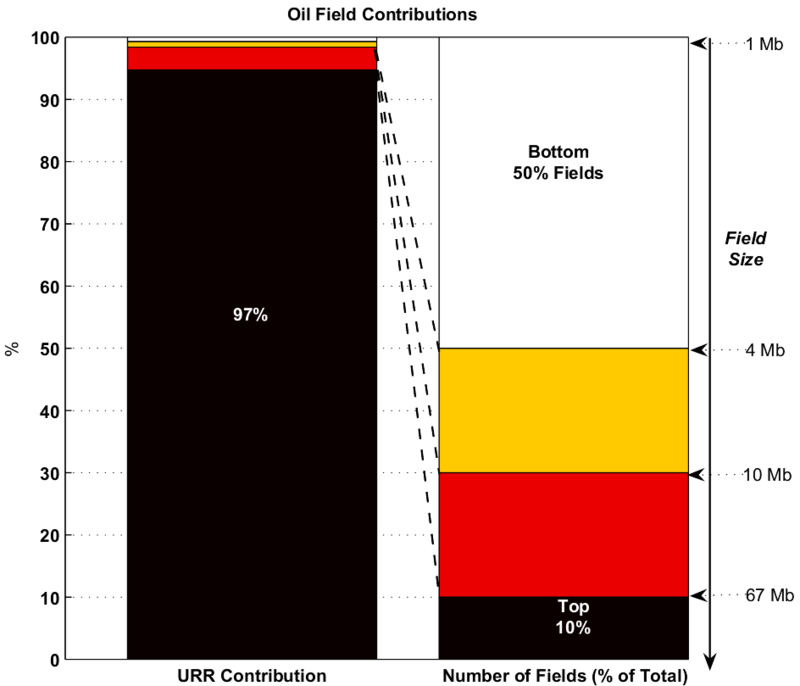 The URR value is function of the minimum oil field size considered. If we fix an arbitrary field size cutoff value at 1 Mb, we get the URR values displayed on Fig. 4. We can see that using the world curvature at -0.07 we get an URR at 270 Gb from about 2,000 fields which is remarkably close to the ASPO own estimate (275 Gb). 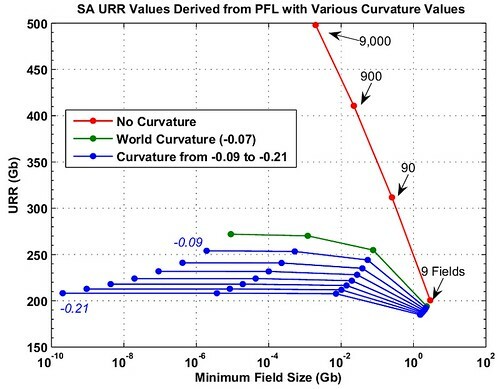 The official URR at 368 Gb would imply a curvature closer to zero around -0.025 with also a much higher number of fields. 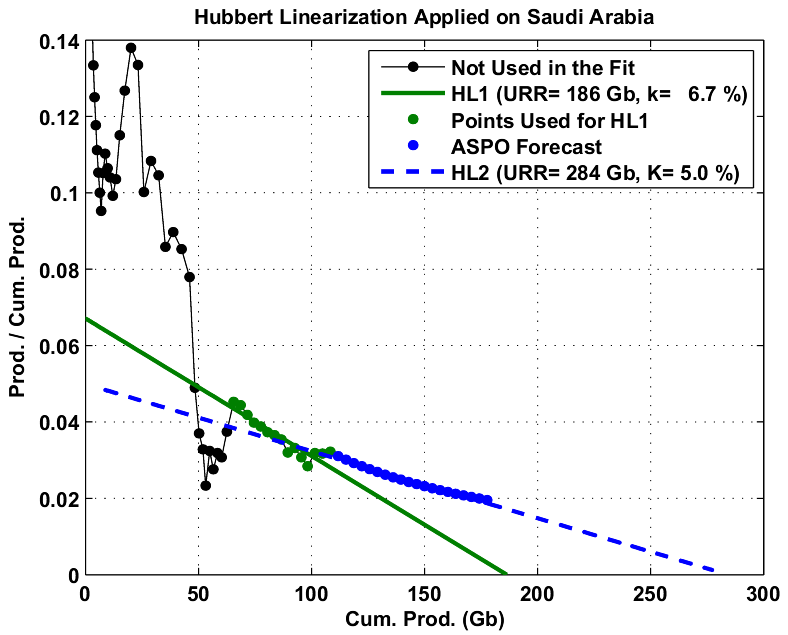 We compare also with the estimated URR values we get using the Hubbert Linearization technique on the production data (see Fig. 5). The first fit (HL1) gives a rather low URR at 186 Gb which would imply a strong curvature beyond -0.3 with a small number of fields (< 400). Fig. 4. Derived URR from Fig. 3 by fixing the minimum oil field size at 1 Mb. HL1 and HL2 are the URR estimate from two different Hubbert Linearizations shown on Fig. 5. Fig. 5. Hubbert Linearizations on Saudi Arabia Production profile (data from BP, Crude + NGL). The blue points are the ASPO forecast which see a constant production level for the next 20 years at 9.5 mbpd (newsletter 66). To further illustrate how hierarchical the oil production is, Fig. 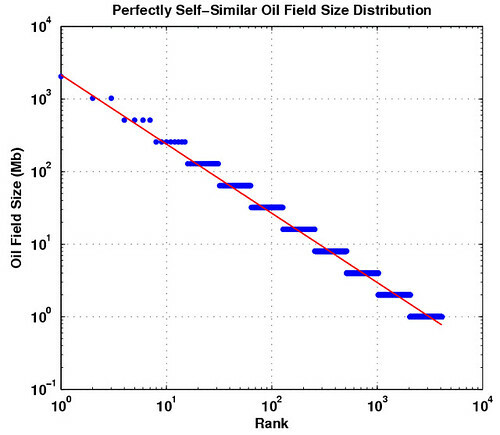 6 gives the contribution of some oil field groups ranked according to their size. Fig. 6. 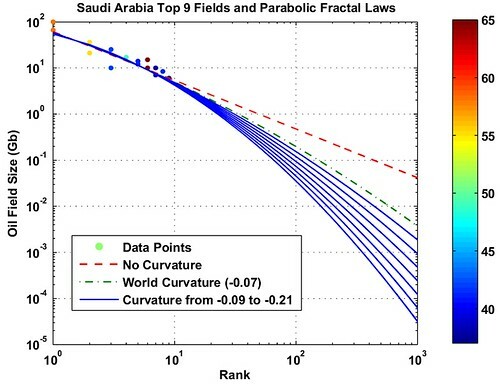 Contributions from oil fields using the PFL law for Saudi Arabia with the world curvature (green line on Fig. 2 and Fig. 3). The top 10% of oil fields (size > 67 Mb) contributes to 97% of the total URR. combined with the Hubbert Linearization technique, the PFL could be useful for tortuous production profiles from immature countries such as Saudi Arabia, Iraq and Iran. only the top fields are necessary for the fit which is interesting because they are usually the most mature and the most documented. However, we implicitly assume that the discovery of large fields has peaked early in the production history and that no giant or super-giants will be discovered. 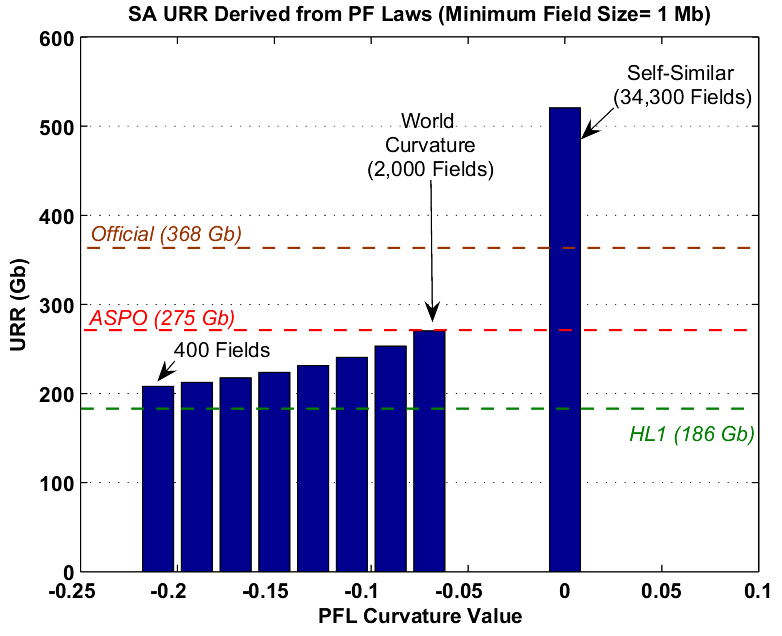 the PFL integrates naturally contributions from small fields and the derived URR is dependent on the minimum field size. 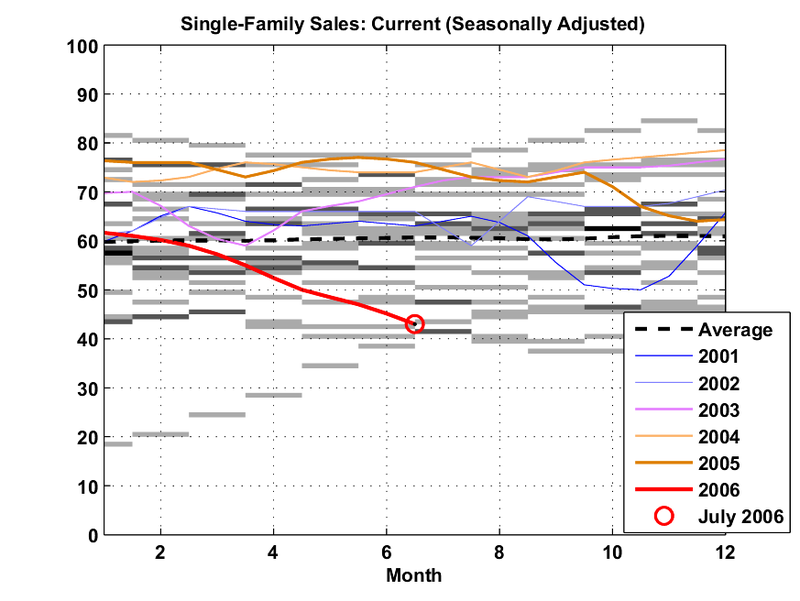 Therefore, some reserve growth can be simulated by changing the small field cutoff value. Narushige SHIODE. Power Law Distributions in Real and Virtual Worlds.